This was one of those books that was....exactly what you would think it would be. That isn't a bad thing...it just is what it is. I think the first issue that I should address is the similarity between this book and A.J. Jacob's The Year of Living Biblically. Yes, they are similar--and Evans even mentions that in one point. However, I really feel that Evans has the upper hand in this face off. For one thing, this book has a better focus than A.J. Jacobs' work. 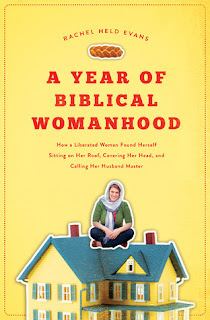 While Jacobs seems to come from the viewpoint of, "Hey, let's try to be religious," Evans goes into her project to explore an issue--Biblical Womanhood--that she encounters in her own life. I will admit I had a little trouble categorizing this book in my mind. On one hand, there is a definitely "Christian Living" element to that. However, while Evans does talk about her own faith, the book itself is more of a cross between a memoir and historical research. This isn't a book I would say is JUST for Christians. It doesn't come across as preachy at all and non-Christian readers, provided they are tolerant of others' beliefs, would probably enjoy it as well, In fact, if there was a group who would be more likely to be offended by this book, it would be Conservative Evangelical Christians. I really enjoyed Evans's writing. It was casual and conversational, but not at all glib. She is very respectful of beliefs that don't match her own--and my favorite parts were when she referred to Orthodox Judaism and her virtual friend who was serving as her expert. She also includes some of her husband's diary entries, which adds a nice dimension to her narrative. She did visit some communities and people who were on the more extreme ends of the spectrum--the Amish, a polygamist, a quiverfull follower. I will say that, while these episodes were interesting, they didn't stick with me as much as other parts of the books. Mostly, I remember reading Evans' mishaps as she tried to adopt some extreme behaviors. All in all, it was a readable, if not exactly surprising, book. I would recommend it to most anyone, and would definitely recommend it over other similar books.